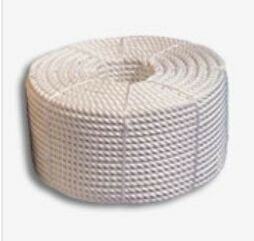 3-Strand 20mm White Nylon Rope supplied in a bulk commercial 220m coil. A very strong & soft to touch synthetic fibre rope which has excellent shock absorption properties. For this reason it is ideal for towing and mooring applications. Ideal for mooring, towing, single point mooring hawsers, stretchers, anchoring, lifting, for use on pulley blocks & general use.